In case you need to install our WP plugin manually, this is a walk through of how to install and setup your event registration form too. Click on Plugins and click the Upload Plugin button at the top. Browse your computer and select the plugin zipfile called registerone-forms.zip. You can download it here. Then click the Install Now button. After installation has finished, click Activate Plugin. 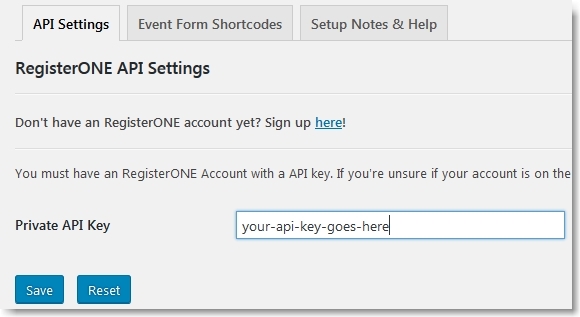 Now you’re ready to plug in your API key and setup your first event registration form! Click on Settings > RegisterONE to open settings. Now switch over to the RegisterONE website, go to Settings > WordPress API, grab your API key. Then just paste it into the Private API key field on the API Settings tab in the plugin settings under API Settings tab. Now you’re ready to use your event shortcodes to generate your event application form. Go to the Event Form Shortcodes tab and copy your shortcode. Add a new wordpress PAGE (not a Post, a Page!) and paste it into the body with nothing else. Be sure to select the RegisterONE Template from the Page Attributes box on the right of the editor page. This will ensure that there are no conflicts between your current WP template and the registration form. SAVE IT. Link to it or add it to your menu so vendors can find it! You’re done. This allows you to keep your vendors on your own website as they register for your events instead of sending them to another website to register.